A century ago, the nation of Sarkoris was murdered. Today, the fallen nation is a horrific, post-apocalyptic nightmare cloven by a vast canyon that connects Golarion to the demon-haunted reaches of the Abyss. This rift is known as the Worldwound, and through it the demonic hordes pour forth, set on defiling the world of mortals and claiming it for their own. Though the demons have so far been held back at the border by barbarians and crusaders alike, the region that was once Sarkoris remains a fiendish beachhead on the mortal realm. Worse, the Worldwound itself is slowly growing - and if something isn't done to halt this blight, the demons it spawns might one day swallow all of Golarin! Ruined cities, such as the shattered capital of Iz, the frozen city of Dyinglight, and the river city of Undarin. Adventure sites ready for exploration, as well as locations like the holdout town of Gundrun, a safe harbour in a deadly land. The Worldwound is intended for use with the Pathfinder Roleplaying Game and Pathfinder campaign setting, but can easily be used in any fantasy game setting. 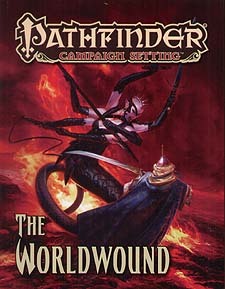 In addition, the Worldwound is the setting for the demonslaying Wrath of the Righteous Adventure Path making this book a perfect supplement for that campaign.